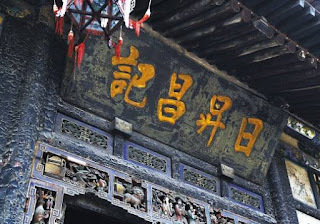 As such inscribed board is usually quite wide and thin, 扁 was borrowed to describe something wide and thin eventually. Since 扁 contains the meaning of thin, so we use it to mean feel contempt or despise (especially on other person) as well, for example: 把人看扁. While for its original meaning of inscribed board, as usual Chinese ancestors created a new character for it， which we will show next. For now, it is time for us to enjoy a Chinese calligraphy with 扁 inside.